This news report was depressing! Dearest and I have been sticking to dark chocolate for our treats, because it’s supposed to be good for you. On the plus side, we’re not eating cookies, pie and ice cream hardly ever any more, so that’s good. On the minus side, it seems we have been buying brands contaminated with lead and cadmium. ARGH! This is not an academic issue for me. I spent weeks going through lead detoxification treatment once years ago; it was non-stop horrible until it was over, then it was amazing how much better I felt than before I’d started. So, no, thank you to lead in my food. But there are a huge number of chocolate brands and only a small number that have been tested for metals. Plus, some of the companies had bars on the bad lists and some on the good lists, so how could I ever trust ANY of their bars? It’s all kinda scary and frustrating. I went through the chocolate we had on hand and threw out the Ghiardelli. Then I noticed the one we recently tried for the first time and LOVED – Divine 70% Dark Chocolate – was not on any tested list (good or bad). But the label said it was FAIR TRADE, so I did some digging on that score and found a web page about fair trade chocolate. 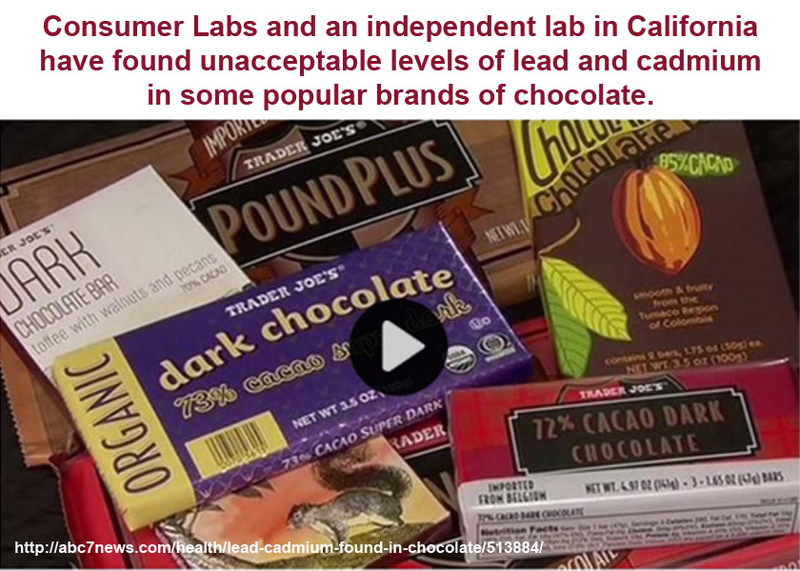 Funny thing … it looks to me like the companies with metal contaminants are the same companies on the “not recommended” lists because of little things like buying chocolate where slavery and child labor are practiced. I noticed one interesting caveat to this site’s list. A company named Edensoy was on their recommended list, then had a slash put through their name with a link added that went to an article about how the company is trying to opt out of the Obamacare birth control mandate. Sometimes the Left is so hypocritical about their issues. I’d bet anything these people are mostly on-board with micro-managing carbon levels in the air that probably are not harming the planet in any way, but apparently have no problem turning a blind eye to the environmental damage that birth control pills are actually causing.